«Haul» matelot, hé ho hisse et ho ! Valparaíso is easy to reach as a day-trip from Santiago, which is what I did. The Tur-Bus bus service runs very regularly (it seemed to be every 15 minutes at peak times) from Santiago’s central bus station, which handily is just next to my hotel. The 2-hour journey cost me 2000 CLP (£2) having bought an advance ticket. 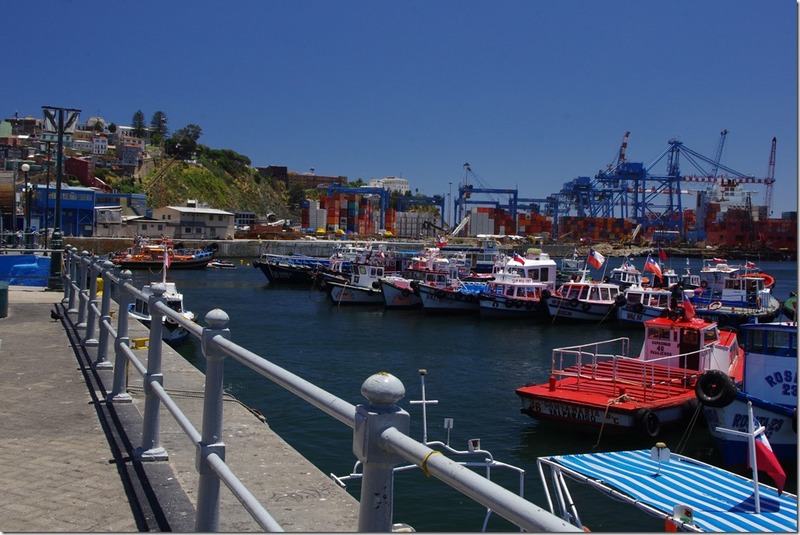 There’s a good quality motorway, Ruta 68, linking Santiago to the port city. Once you’re out of the capital, the landscape is quite reminiscent of parts of northern Spain – hills that have been parched by the sun (it was in the mid-20s C today, with a very strong sun), other than a few hardy shrubs. Route 68 itself runs mainly in a more fertile valley with vineyards and the occasional field of maize to the sides. 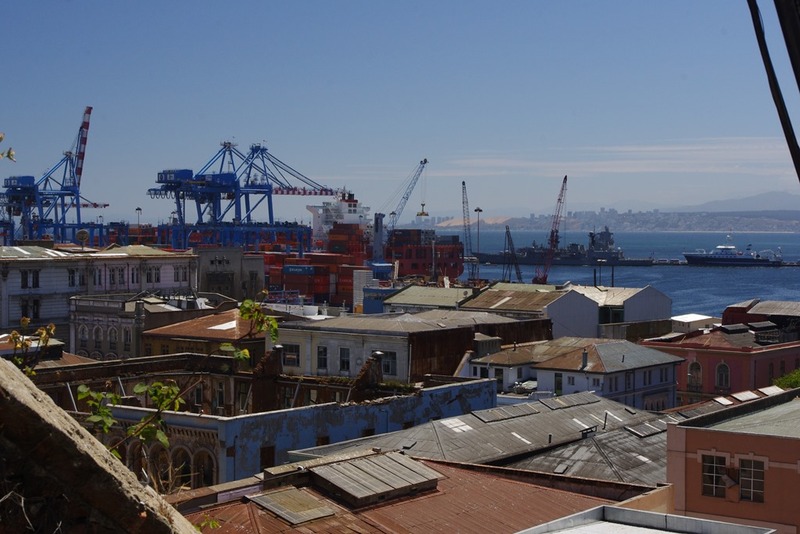 The city of ‘Valpa’ (as it’s known locally) is a major cargo port, and – despite it taking several pages in my guidebook there didn’t seem to be much more to it than that. Most of the tourist sites are within a small area near the port. I’m glad I was only here on a day-trip, and not staying longer, as I think I would have run out of things to do. As it was, I had seen most of the things I wanted to within a couple of hours. The tourist areas themselves are pretty enough but turn a corner and its easy to find once-opulent buildings in a severe state of decay very close by. 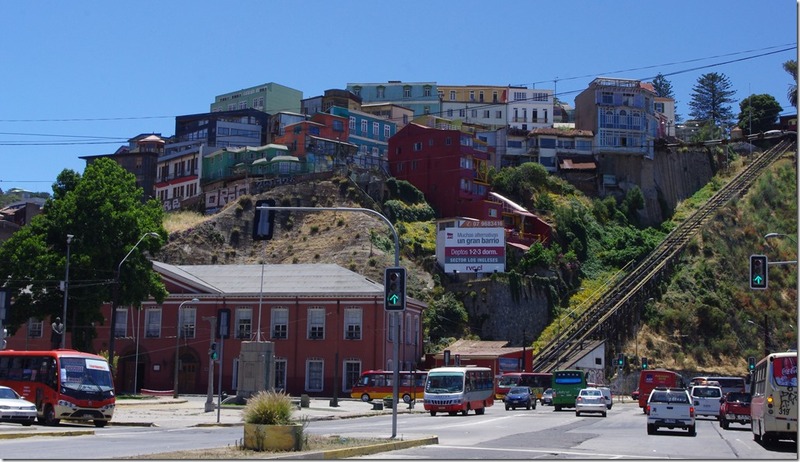 Part of this will undoubtedly be due to earthquakes, of which Valparaíso has suffered a large number of the years, but I also got a sense that some of it was just neglect, or a lack of money. This can easily be seen in the picture above. 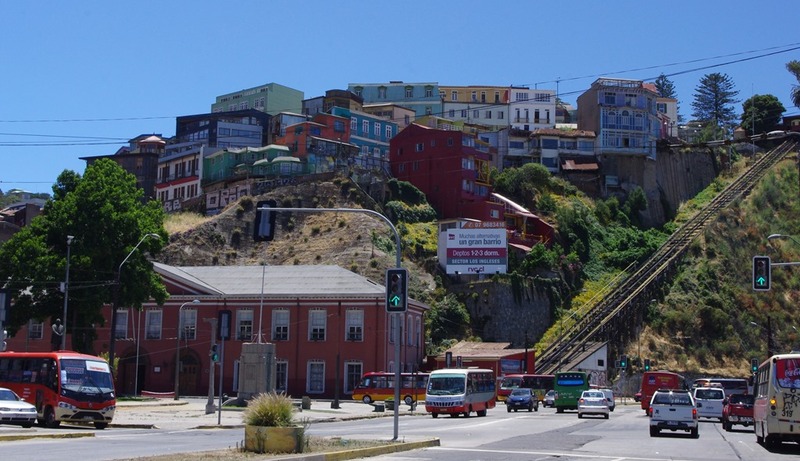 The thing for which Valparaíso is most famous, of course, is that it’s built on a steep cliff-face leading down to the sea, with nineteeth-century funiculars linking the town together. These are somewhat rickety, by all accounts – I didn’t get to go on one personally – but I did claim 161 steep steps to take the first photograph in this post! One of the unique features of the Spanish-speaking world, with which you may not be familiar, is the apparently acceptable habit of random street sellers interrupting your meal in restaurants to try to sell you things. (This tends to be restricted to less-touristy restaurants, it’s mainly in cheaper places.) In my experience, this tends to be limited to flower sellers in Spain, but here in Chile it can be any old ‘tat’. I must tell you about my experience this evening, once I’d returned to Santiago: I’d gone to a pizza restaurant, which served the oddest pizza I’ve had. It was about 6 inches diameter, with about a 1-inch deep bread base, and about another inch of topping piled on top, all served on a plate that was exactly the same diameter as the pizza itself. You’d have thought a pizza restaurant would have established long ago that melted cheese needs space to spread. It was impossible to avoid it going all over the table as I tried to cut through the massive crust. Anyway, while I was doing battle with this beast, a lady appeared and dumped a load of oversized bank notes on my table, and then on everyone else’s tables. Once she’d been around everyone, she came around again to collect them all up. No-one made an attempt to buy them. I guess, as in the USA, fake bank notes are legal to produce as long as they are oversized, so they can be used for film and television. Within five minutes, an older man interrupted me with a large bag full of various top-branded perfumes. I suspect they weren’t all genuine. When I ignored him, he moved on to another table. While he was still going around other customers, another boy, probably about 14 years old, came in with the strangest item yet: it was essentially a plastic test-tube, filled with water, with a red plastic heart floating in it. Again, he went to each table and put one of these on the table, then immediately went around collecting them up. One person in the pizzeria did get his wallet out for this odd ‘gift’. I have no idea why, and I decided not to stay any longer. I paid the bill and made a swift exit before anyone came in with anything else.